New watches with skull design, limited edition? 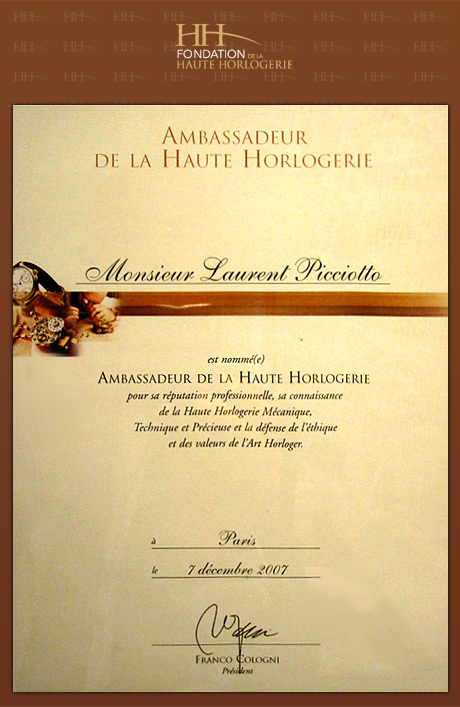 Watchmakers from Switzerland have already done so extensively. 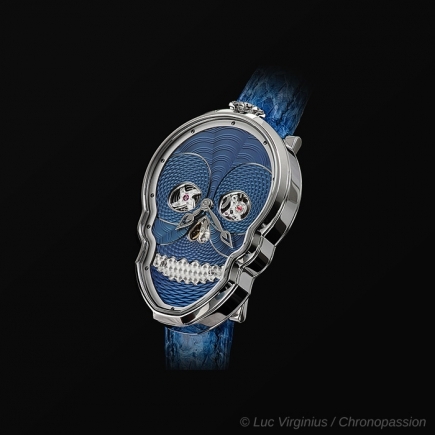 There has been a vast skull movement that has recently set most watch brands on fire, a mechanical skull avalanche that abounded on the dial of each watch at varying prices. Beyond the original Swiss watches and at the right price, everyone saw their replica arrive at a low price on a parallel market where the skull was also very popular. However, the design of Fiona Kruger's watch brings something different. The skull represented on the dial of this first designer Swiss watch is thin and subtle, designed by Fiona Kruger herself. Always in motion, Fiona Kruger constantly has on her a notebook where she lays down her ideas for each of her watches, dressing her dial with a skull that is sometimes dark and sometimes cheerful, just like the design of the skull representations of the Dia de los Muertos that adorned the watches of Fiona Kruger but also of Romain Jerome, HYT or Bell & Ross, each with its replica at a low price, the result of their notoriety. Worn by men or women, the watch with Fiona Kruger's skull dial is above all a watchmaking object, a limited edition whose price fully justifies the Swiss fine watchmaking mechanism and the highly crafted movement within a case that is itself in the shape of a skull. 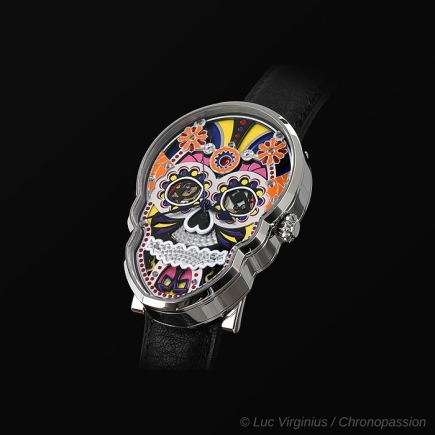 It is precisely this skull case that makes all the difference to Fiona Kruger's watch: it is not the only dial that is skull-shaped but the entire case - polished steel case or black PVD-treated steel case for certain limited edition models, particularly the Black Skull limited edition that is becoming difficult to find, in Switzerland or elsewhere in Europe or in the world. Fiona Kruger therefore does not have watches with a highly complicated skull design, with a dial teeming with indications such as those found at Greubel Forsey, A. Lange & Söhne, Parmigiani Fleurier, Patek Philippe, Audemars Piguet or Ulysse Nardin. 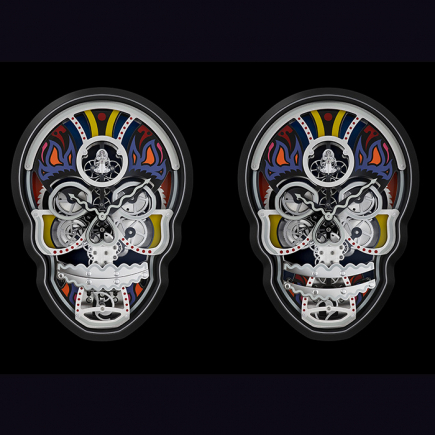 Fiona Kruger's skull, with its replica Petit Skull, Celebration Skull, Vanitas or Black Skull, is a watch for everyday use, these designer and beautiful Swiss mechanical watches with a design sufficiently elaborate to make the replica difficult - mainly because of the design of the steel case which is truly unique to the watch designed by Fiona Kruger. For her first watch, Fiona Kruger has therefore managed to stay away from making a replica of a Bell & Ross, HYT or Big Bang, watches of fine Swiss watchmaking which are also quite similar in price. Fiona Kruger's Skull watch clearly displays its own identity and, even with a three-handed dial, claims a certain uniqueness in Europe and the world. Chronopassion is AUTHORIZED RETAILER of FIONA KRÛGER since 2012,date of the brand's birth.